SUNGNAM, South Korea — The black-and-white photographs that were published last month in a North Korean newspaper appear no different from other propaganda coming from North Korea: they show the supreme leader, Kim Jong-il, touring a steel plant in a fur cap and his trademark sunglasses. It is the pudgy but stern-faced young man next to him, dressed in a snappy Western suit and dutifully scribbling in a notebook, who has spurred intense speculation. Could this unidentified man be just a plant manager? Or could this be the first public appearance of Kim Jong-un, the North Korean leader’s third son and heir apparent? Little is known about the inner workings of the secretive North Korean government, not even the identity of the heir apparent. But if Mr. Cheong is right, the enigmatic photographs are the latest signs of the desperate push that the North Korean government is making to build a cult of personality around the son, who is believed to be 27, to prepare him to assume control as the current leader’s health declines. The elder Mr. Kim, 68, appeared to suffer a stroke two years ago, and there have been recent reports that he is suffering from kidney disease. Analysts say that if Mr. Kim dies too soon, his son could be pushed aside in a scramble for power among political and military elites that would end the family’s dynastic rule and might even bring about the collapse of the impoverished totalitarian state. While this internal struggle is going on, problems continue to mount. A ham-handed currency revaluation last fall, aimed at reasserting central control over the economy, is reported to have badly backfired, producing unrest and disaffection with the government. At the same time, the spread of cellphones and DVD players has broken the North’s self-imposed isolation, giving many of its citizens a sense for the first time of how poor and backward their country has become. Recently, the government is said to have given mass promotions and luxury cars to officers in the nation’s powerful military, in a bid to cement their loyalty. 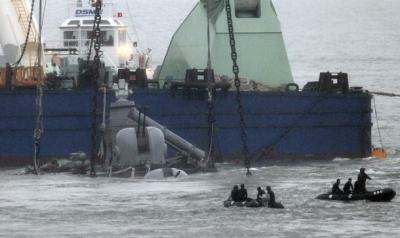 Indeed, the sinking last month of a South Korean warship, which many South Koreans now suspect was the work of a North Korean torpedo, is widely seen in the South as a show of strength by the North aimed at winning the military’s support for the younger Mr. Kim. Despite the breakdown of communications barriers, reliable information on the political system remains scant. Photographs like those that appeared in last month’s Rodong Sinmun, the ruling party’s newspaper, are among the limited evidence that analysts and intelligence experts must rely on as they try to understand the efforts to shore up the Kim dynasty for a third generation. Not much is known about the man who could become the next leader of the unpredictable, nuclear-armed country, even including what he looks like. The only firsthand account comes from a Japanese chef who once worked for the Kim family and knew Kim Jong-un only as a personable and precocious boy. The only known photograph of him was taken when he was 11 years old. It is also unknown whether Kim Jong-un has any rivals. For a time, North Korea watchers regarded the leader’s eldest son, Kim Jong-nam, 39, as the most likely heir — until he was caught by Japanese authorities using a fake passport to visit Tokyo Disneyland. He now lives in Macao, giving occasional paid interviews to Japanese television. Reports out of North Korea indicate that the government is trying to build a cult of personality around Kim Jong-un, just as it did during the last succession, when the current leader replaced his father, the North’s founder, Kim Il-sung. But while Kim Jong-il is believed to have had two decades as heir before assuming power after his father’s death in 1994, his son is being rolled out much faster. Moreover, some experts say, the average North Korean is growing worldly and aware of life outside the country’s borders, making it increasingly unlikely that the government’s often bizarre propaganda efforts will succeed. On Monday, the Daily NK, a Web site that specializes in information on North Korea, said it had obtained an internal propaganda document that called Kim Jong-un the Youth Captain and quoted his father (who has his own title, Dear Leader) praising his loyalty and good works. The documents also extolled the son for such achievements as managing a fireworks display last year in Pyongyang, the capital, and becoming a proficient driver of military vehicles, the Daily NK reported. Mr. Cheong, the analyst, said that members of local North Korean work units and government employees had been taught a new song titled “Footsteps,” which lauds Kim Jong-un’s fitness to follow his father as leader. 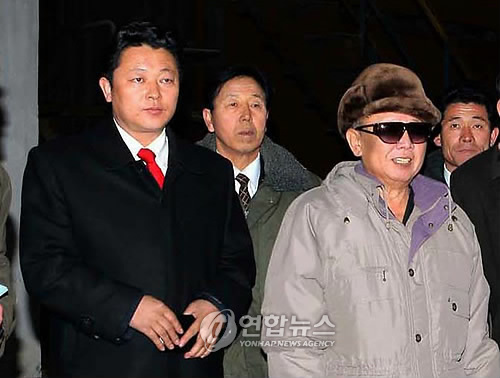 Kim Jong-il has been rushing to prepare the ground for his son in other ways, analysts say. They said that wiretaps of North Korean phones by the South’s intelligence agency revealed that the younger Mr. Kim was appointed to a top post in the ruling party’s internal security apparatus last year and that he now worked in the same building as his father. The analysts have offered many predictions about what may happen when the current leader does die. One is that his brother-in-law, Jang Song-taek, 64, widely seen as the second most powerful member of the inner circle, could serve as a regent until the younger Mr. Kim is ready to rule — or simply hold onto power for himself. “The photo is not of Kim Jong-un,” a Unification Ministry official said, speaking to reporters on the condition of anonymity. Another government official, who also asked not to be named, said the photo showed Kim Kwang-nam, chief engineer at the Kim Chaek Iron and Steel Complex in a northern province. At a recent private meeting in London, a former senior United Nations’ official, drawing on experience relating to a wide range of countries, said that transforming a “failing” or “fragile” state was not something that could be done overnight. Those involved needed to think in terms of ten to twenty years rather than weeks or months. Regardless of whether or not one accepts the idea of the Democratic People’s Republic of Korea (DPRK or North Korea) as a failed or even fragile state—and the term is often used in some quarters—the idea that one is in for the long haul in bringing about major modifications in behavior and attitude is certainly a good one to have in mind when dealing with the DRPK. It was such an approach that marked the Republic of Korea’s policy towards the North under former Presidents Kim Dae-jung and Roh Moo-hyun. Since the Lee Myung-bak government took office in the Republic of Korea (ROK or South Korea) in 2008, it is fashionable to dismiss the policies followed by his predecessors as an expensive failure. Sneers about “ATM diplomacy,” innuendo about Kim Dae-jung’s motives, and references to his successor Roh Moo-hyun’s naivety, are the commonplace of South Korean academic and press comment, and are heard much further afield. “Sunshine” or engagement have become terms of mockery. The Lee government has adopted a more aggressive policy towards North Korea. It has not refused assistance outright, but has couched its offers in such a way that rejection is inevitable—the most recent example is the “grand bargain” proposed in 2009 in which the DPRK must first give up its nuclear program to receive security guarantees and aid. This is then played back as evidence that the North is incorrigible and not deserving of assistance. […] No doubt engagement was expensive and sometimes the means used to bring it about were shady, but it was producing benefits. The South, and to some extent the rest of the world, now has a far better understanding of how North Korea works then it did before engagement began. Within the North, a large number of people have come to see their southern compatriots in a less hostile light and have some, even if limited, understanding of the economic and social structures of South Korea. Perhaps some of the assistance provided was diverted away from its original purpose, but enough rice and fertilizer bags reached areas far away from Pyongyang and enough people were willing to ask questions about the South to show that the impact of engagement extended beyond a small circle of ruling elite. Slowly, the policy was creating a group of people who could see benefits in remaining on good terms with South Korea and who had wider links with the outside world. Engagement has worked in other countries, most noticeably China, and I believe that it was beginning to work in North Korea. There was never going to be a speedy change in attitudes built up over sixty years, but stopping the process after ten was not a wise decision. *James E. Hoare was Britain’s Chargé d’Affaires to the DPRK from 2001-2002 and opened the British Embassy in Pyongyang.